In total, Arbitron conducted 1,370 in-person interviews with consumers recently exposed to aerial media campaigns. The interviews were divided among three surveys and administered as follows. Arbitron conducted in-person interviews with 609 randomly selected respondents aged 18 and older entering the Kmart retail store in Jonesboro, GA. The survey was fielded between Monday, March 20 and Sunday, March 26. Starting on Saturday, March 18, and continuing throughout the course of the test period, an aerial banner advertising the opening of that location’s new home appliance department flew within a three- to five-mile radius around the store. • Over one-third of Kmart shoppers recalled seeing an aerial banner flying in the local area during the past week. • Awareness of the aerial banner increased threefold over the duration of the week. they learned about the new home appliance department. On November 18 Arbitron completed 362 in-person interviews with attendees of the highly anticipated Ohio State vs. Michigan NCAA conference game. The advertisement flew over a three-mile radius around Ohio State Stadium starting at 10:30AM on game day and ending a half-hour before kickoff at 2:30PM. The interviews were conducted outside of the stadium (in the “tailgate” section) between 12PM and 5PM that day. • Over nine out of 10 stadium attendees recalled seeing an aerial banner flying overhead that day. • More than one-third of stadium attendees specifically remembered seeing an airplane advertisement for the Chipotle quick-service restaurant chain. • Stadium attendees who recalled seeing the aerial ad for Chipotle felt they were more likely to visit the restaurant compared to the average person. 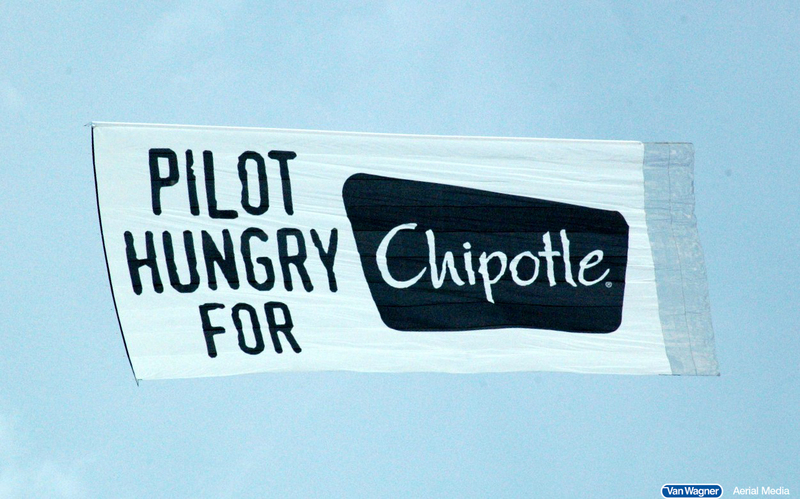 The advertisement for Chipotle also flew over Ohio State University for a few hours, during the week of November 27 (weather permitting). Arbitron conducted an additional 399 in-person interviews with respondents on campus (mostly students) on Thursday, November 30 and Friday, December 1. • Seven out of 10 students and visitors recalled seeing an aerial banner flying over the campus in the last seven days. • Nearly nine out of 10 of those who noticed an aerial banner over the campus remembered the advertisement was for Chipotle. We provide the largest aerial banners in the industry and consistently fly over the most popular NCAA and NFL games each year. Visit our capabilities page to learn more about what we offer. Also, make sure to check out "Where We Fly" to get a deeper understanding of our key markets. If you don't see your location listed, don't worry. We are the only truly national aerial advertising company and can accomodate clients in cities accross the United States. To learn more, contact us today or click below for a free quote. *Please note that these studies have been abbreviated in the context of this page for easier readability and digestion. For more information about these case studies, or to request the full transcript, please contact us.